This activity was so much fun, and my four year old and two year old loved working together, so it was great multi-age play in the end! 5. 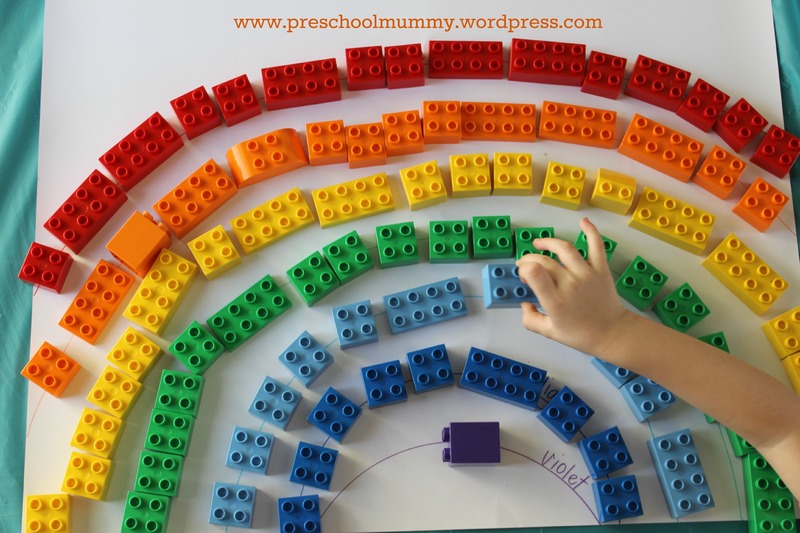 Bring over rainbow colour vocab chart onto the carpet. I start placing a few blocks along the corresponding arcs. “Why don’t we arrange the colours like a rainbow?” Says Master Four. Bingo! Engagement! 6. Boys spend next ten minutes placing the bricks down, arranging them, manipulating them so that more will fit, talking about colours, negotiating with each other. 7. Mummy grabs cup of tea opportunity by the horns (and then grabs camera for evidence of peaceful, meaningful play experience her kids are enjoying).